Daffodils or Jonquils? Retirement or ReWirement? And a medical issue that I just discovered I have. I was so excited that spring had finally arrived that I ran out and bought some daffodils and put them in my green fiestaware pitcher. I love this pitcher. It was given to me by my long-time friend Jim who had boatloads of the stuff. He has since curated his collection to a few select pieces and sold the rest. I was lucky to get this item and I always have it on my mantle, with or without flowers. Thank you all for your comments on the previous post. My retirement or “re-wirement” as my friend Joan calls it is a work in progress. I have not relaxed one day since being home. I have anxiety dreams each night and still think on Sunday nights, like tonight, that I have to get up and go to work tomorrow. I’m sure this will pass and my rewirement will begin. I am looking forward to being rewired. The Husband and I have been purging, packing and painting so we can move. Where to? That’s the million dollar question. I heard about this book by Marie Kondo, a former Shinto shrine maiden: “The Life-Changing Magic of Tidying Up: The Japanese Art of Decluttering and Organizing.” I haven’t gotten it yet, but read enough and heard enough about it to get the gist. I will get it one of these days after I’ve tidied up my bookshelves. I’ve also seen some videos she has of organizing an underwear drawer. Now, Miss Kondo is a very petite woman. And not an American. After I watched her fold her teeny tiny underpants and teeny tiny bras and put them neatly in a teeny, tiny drawer, I realized I would have to modify her methods. I have bigger drawers. In both senses of the word. I am continuing to purge, but my green fiestaware pitcher will be with me wherever I end up. 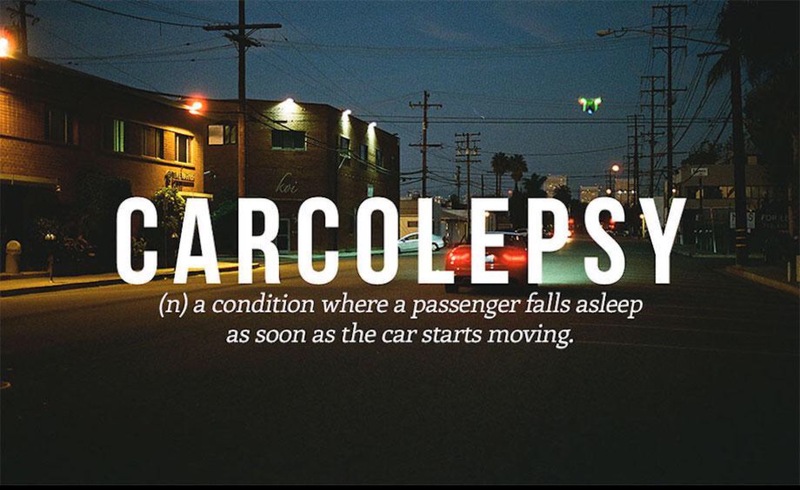 On another note, I recently discovered I have a severe case of this: So in case I’m ever in a car with you as a passenger, don’t be offended if I doze off. You are so good…awake or…not! Aww love it! Yes… remember those 3000 pieces of Fiesta I inherited? THREE THOUSAND. eBay!! And gifts for years! When I organize and downsize, I call it “japanization.” I love those rooms of theirs: bamboo and rice paper walls, no dust, and no furniture but for a shellacked black table containing a bonsai tree. Looking forward to running into you somewhere in Dixie!! I am going through the opposite sentiment about work. This coming Thursday will be my first day back after the long medical leave and I am already getting stressed out about oversleeping and getting to work late. Enjoy the weather. Come out and draw with me before I get stressed out by work again. Wow, awesome painting Carol – beautiful glass pitcher color and reflections. Yeah to retirement, my husband did it last week and now it’s the process of trying to figure out a new schedule to fit everything in, including the blog. This is a really beautiful painting. The painting is beautiful, love the layering on the pitcher. Carol, feel as if I have known you personally! Love the daffs – and the jug! The painting is one of your best !you are mastering a loose style -hats off to you! Watercolor is so tricky! As far as Sunday Night anxiety it does go away- it turns into Sunday night relief and happiness!!!!!! The daffodils are gorgeous but not as much as how you painted that Fiestaware pitcher, Carol. I like the soft bleeding edge you got on the right, shadowed side and the warm color you dropped into the green which gave it that round shape. Beautiful and loose! As long as you are not the driver when this condition presents itself! Hope rewiring has begun! Magnifico pitcher & painting! Love the light you saved on the pitcher and the translucent layering. So pretty! My husband & I recently retired. We are down sizing, running to salvation army, giving things away, and figuring out where to go, what to do. So many options, yes? At least I no longer have to get up at 5:30 am to get to work on time. This is good! This is a beautiful painting and doesn’t need much at all to finish it off – lovely, light washes make it sing of spring 🙂 Ah, the newest fad = uncluttering based on this book, seems like it’s mentioned everywhere. All we need to do is release all the stuff we think we need and then just get rid of it – books to a library or retirement home, clothes to Goodwill or any other place like that, etc. Yeah, sounds SO EASY but it’s not!! That’s why every year we gain pounds of stuff around us (and sometimes on us! ha ha – had to laugh about the drawers! ha ha). On Sunday night, have a glass of wine and say, “Celebrating not having to go to work in the morning!” You’ll get the hang of it soon, I’m sure. Really great painting, feels so light and sunny! Beautiful job on the painting of the daffs in that wonderful vase with the round shape!!! I’m sure you will settle into a routine soon and those Sunday night stressful thoughts will subside. I am now picturing a tiny woman folding her tiny undies. lol My husband has that same medical condition. I do the driving and as soon as the car starts to move he’s asleep. Enjoy…and come out sketching with us. Lovely painting, Carol!!! I actually have that book, have been trying for a few months… I like her approach of holding each thing in your hands and asking, “does this spark joy?”. But I still have tons of stuff. Apparently I’m very joyful. I’ll look for the video. Gorgeous daffodils, Carol, and I love that pitcher! Good luck with all the tidying up, very therapeutic. I’ve done that 2 or 3 years ago. As always a pleasure to see and read. I love the daffodil painting. I get to pick mine in the yard though, so I feel lucky. They are my favorite flower. We retired a few years ago. It took me forever to convince my husband it was okay to sleep in past 6:30, though. Having a task at home will help the transition. I, too, have carcolepsy. I developed it as a child when we traveled with my dad. He wouldn’t stop except for gas, so we learned to pass the time by sleeping. Even now, I can drop off in a few minutes, especially if my side is in the nice warm sun. So lovely with such a dreamy quality. You crack me up. Big time. We’re in flux, too. 6s and 7s… 6w and 7s. Pretend that 6w stands for 6 what. K? Hi Everyone, thank you so much for your comments. My retirement/rewirement has been so stressful I’m ready to go back to work! LOL! I have a feeling I’ll have a new job soon. Good luck with your “new normal”. It took me about a year to fully adapt but I love it and am busier than ever…not enough time to paint! I love your painting and learn from it every time I look. 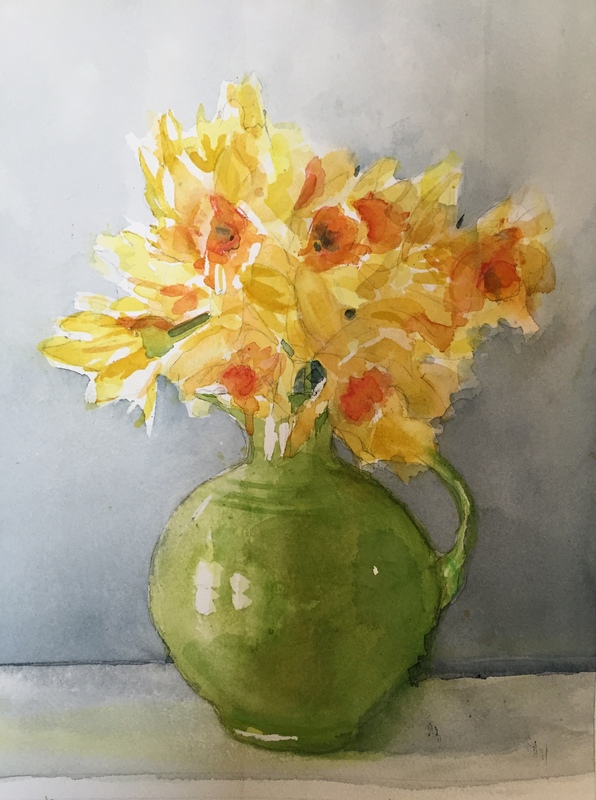 I love the jug, the daffs, and the painting of them – beautiful Carol. Lol at the drawers – me too – I and my whole family need that book badly.